In last month’s article (you may want to read first) I introduced the concept of Relational Presentation, where a speaker navigates within a vast network of PowerPoint slides called a Presentation Network. Such navigation allows quick and dynamic selection of individual slides, even if thousands are available. In other words, a speaker literally creates or customizes a visual presentation on-the-fly. This article takes a closer look at Relational Presentation’s finer mechanisms, particularly the use of visual elements to create what we call “communication special effects”. Maybe I’m biased, but I truly have the greatest job in the world. I get to play with people’s minds for hours on end in workshops, and then they actually pay me for it and ask for more! Relational Presentation methods are fascinating, in part, because they are full of illusions. As I worked with Mayo Clinic trainees last week—a very bright group at that—I asked, “Did you see what just happened?” or “What just happened?” or “How did I do that?” Blank stares. My questions, of course, were very unfair because there was no way they could have known. I was demonstrating some of the components we’ll look at next—Multiple Meanings, Hidden Meanings, and Optical Illusions. 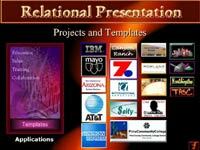 Relational Presentation relies heavily on what presentation professionals call “visual communication”, where pictures, graphics, diagrams, video clips, and animations SPEAK to the audience, even if the presenter never says a word. 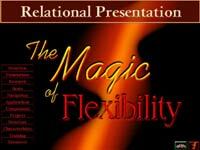 But Relational Presenters take matters a step further and often give visuals MULTIPLE purposes or meanings. Notice the slide to the right. It’s a switchboard I use for showcasing projects, clients, and applications. In one sense, the little thumbnails on this slide are purely functional; they each link to their own slideshow and thus visually tell me where to find the content I need. However, there is a pretty obvious secondary (unspoken) purpose as well. Is anyone surprised that I often linger on this slide a few seconds longer than necessary, before clicking one of the links? Do I want audience members, perhaps future clients, to glance through all the featured logos? Absolutely. I don’t have to say a word. The visuals speak for themselves. Sometimes I purposely hang out on this slide for awhile, telling stories, implying viewers can interactively request details on specific projects. The indirect goal, of course, is to enhance my credibility. During an hour-long presentation, I may casually visit this slide several times to reinforce the imagery over and over. Notice, also, the branding elements in the background. This one slide simultaneously facilitates navigation, branding, and marketing. Look at these two slides. The one on the top is my Network’s Cover slide (like the cover of a book) and the other is my primary (Main) switchboard. Their appearance is quite similar and most observers don’t notice me shifting back and forth between them. That’s good. I don’t want them to notice. I can mask some of my customization activities that way. In reality, these slides are vastly different. The Cover show has many hidden zones for special (and secret) invisible navigation whereas the Main Switchboard is designed for purely visible (and obvious) navigation. The reasons for these differences are beyond the scope of this article, but I use the optical illusion (in this case giving the slides similar appearance) to basically fool the audience into thinking there is only one slide. Look at the last graphic below to see what the Cover slide looks like to me (in my mind’s eye while I’m presenting). Optical illusions also allow a presenter to seemingly jump out of a bullet list at any time, visit slides in other shows, and then immediately return to the bullet list and continue with the next bullet point. It’s all trickery, but amazingly useful and effective for helping fight the well known “Death-by-Bullet-Point” syndrome. Let’s return now to the construction company’s dilemma. What attendees didn’t know coming into the meeting was that company officials had created a special Presentation Network (using some of the above techniques) just for this event. It contained multiple layers of detail for each department’s budget and operations, along with “what if” scenarios and possible options the company could explore. In other words, right from the start participants were introduced to an interactive, problem-solving environment based on PowerPoint. The meeting’s “Presenter” became more like a moderator of the ensuing discussions. Attendees could instantly request any level of detail across all departments and collectively work towards an agreeable reorganization—and they did so until arriving at consensus. Was the process still painful? Yes, but they emerged from the meeting with a cohesive plan of action. Even more importantly, the creative nature of the event spawned several new ideas for restoring portions of lost business. Today the company is stronger than ever and growing. The responses to last month’s article were tremendous, resulting in hundreds of Guides being emailed. 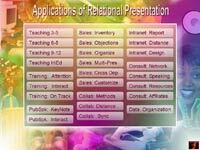 I have one word of caution, and hopefully inspiration, for those of you ready to try Relational Presentation techniques—Visual Interactivity is more than just doing the same things you’ve always done, but now with spiced-up PowerPoint slideshows. The concept is a complete change of mindset and methodology. 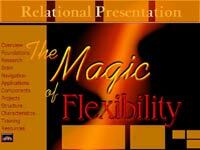 To be an excellent Relational Presenter, you must first UNLEARN PowerPoint. That’s when the fun begins!